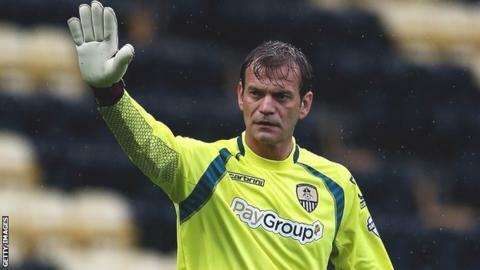 Former Manchester United goalkeeper Roy Carroll has joined League One side Notts County on a one-year deal after he was released by Olympiakos. The Northern Ireland international, 36, arrives at Meadow Lane as Shaun Derry's first-choice number one following Bartosz Bialkowski's move to Ipswich. Carroll has won three consecutive Greek titles with Olympiakos since 2012. He has Champions League experience with both the Greek side and Manchester United, where he spent four seasons. Carroll has previously also played for Derby County and West Ham in the Premier League, Rangers in the Scottish top flight, Odense in Denmark and OFI Crete, before joining Olympiakos. The former Wigan Athletic goalkeeper, who started his career as a trainee with Hull City in 1995, is set to make his competitive debut for the Magpies in their season opener against Preston North End, having already featured in two pre-season matches. Carroll is reunited with former Manchester United team-mate Alan Smith at Meadow Lane, with the former England international having also agreed a one-year deal.